Every once in awhile I get the chance to go to an auction. It is so interesting to watch what dealers and other buyers gravitate to. 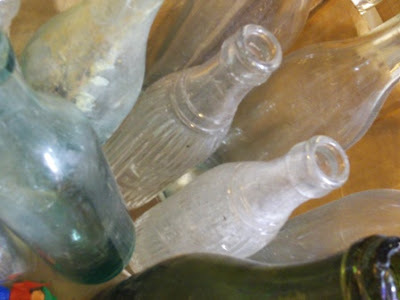 I've have been wanting to find more aqua bottles to put in our garden window along with little milk bottles. 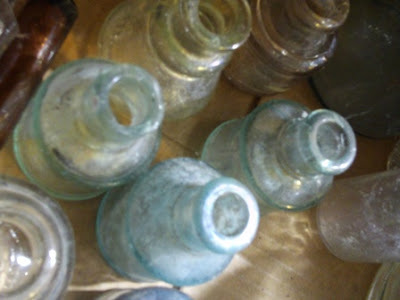 Much to my surprise there were two boxes of lovely vintage and antique bottles at the auction. Lots of people looked at them but only a few placed bids. Guess who won? 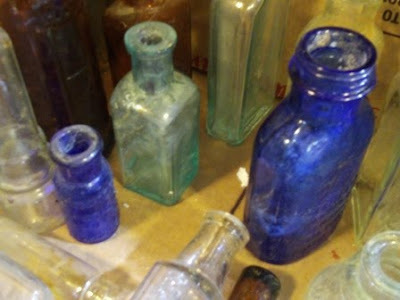 I'd like to embellish some with vintage findings, crystals and others like a little beach in a bottle. Some of them are 100 years old made of hand blown glass. There are few with pearlized areas but, I don't know what caused it. 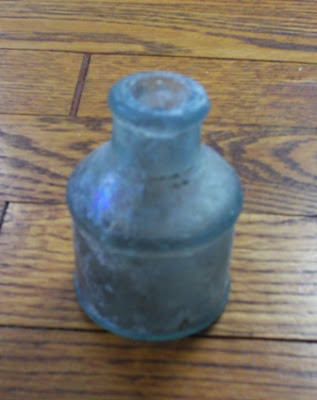 The aqua bottle in this picture is an old rounded bottom soda bottle. The fluted ones say Julep on them. 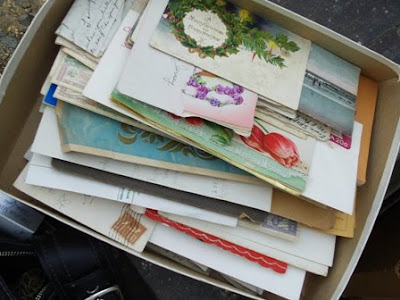 Box of vintage postcards and interesting items. 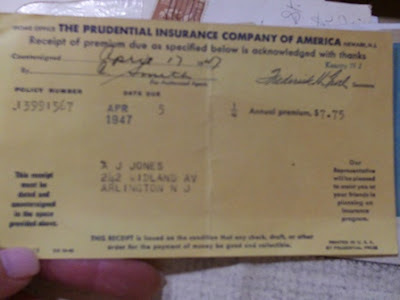 Annual Insurance Premium for $7.75. Don't we all wish? 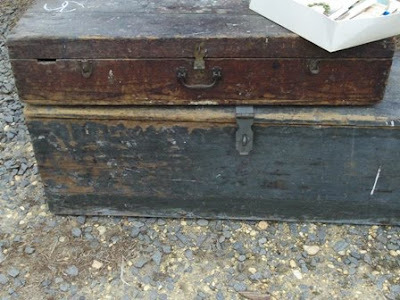 Two old wood boxes in need of refurbishment. The smaller one had tools in it. My DB wanted this box of interesting items. 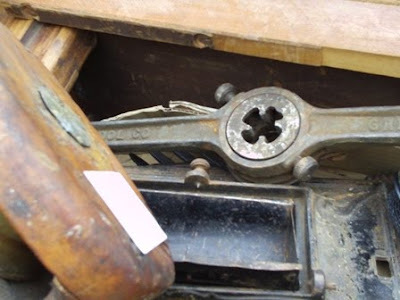 This is one of the items inside; an old envelope sealer that weights a lot. Apparently this should have a roller inside the well and a lid. 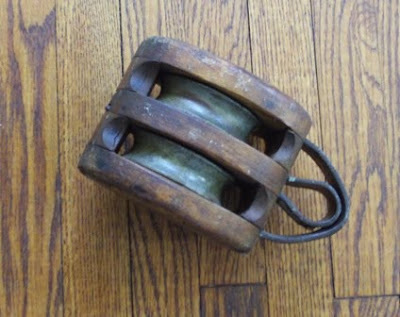 He also spied this old pulley. 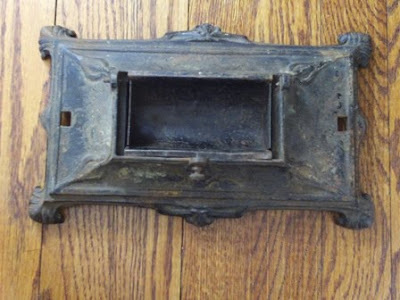 Vintage industrial kitchen item??? 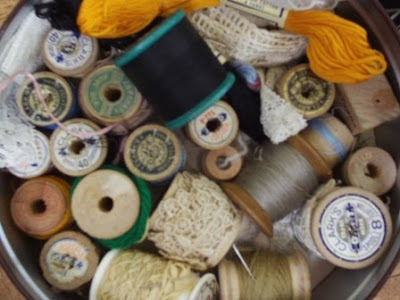 A box of old spools, and little jar of buttons. If anyone has any experience for cleaning out the old bottles I'd appreciate any tips. Posting on this blog has made it more apparent the list of things I like is pretty long. One of them, is industrial and lab decor. 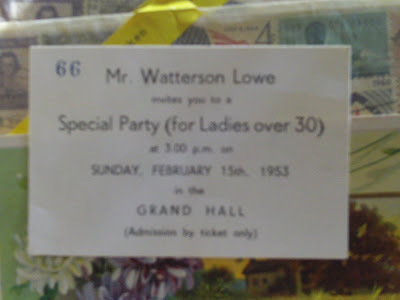 It shares decades old fondness with shades of white and the time worn. Maybe, what makes them all so appealing is how different they can be or are. The industrial part is likely due to the numerous hours I would spend in my father’s garage/work shop. 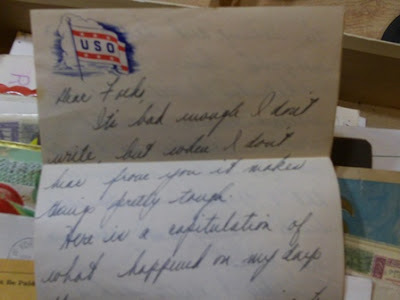 I liked his old wood tool boxes, dolly’s, shelves, cabinets with all sorts of drawers of treasures, jars and bottles of tidbits, oil cans, clamps, pulleys, work lights, metal stools, chains, gears, funnels, welding masks, pot belly stoves, plum bobs, survey equipment, table saws, corbels, oak planking, boat parts…..You name it. The garage was also where we would end up talking. Today, his garage is much smaller but, we still talk there and he still calls it “my office”. Which leads me to our kitchen. It pretty much looks the same as the day we moved in except for a new dishwasher and the counters have been decorated with a microwave and a coffee pot. Not shown: opposite the sink is a built in desk . On the other side of the cook top is a bar stool height counter. Next to the refrigerator is a small pantry closet. Then there is the brick. The arch part is kind of neat. Why, couldn’t it have stopped there? The brick is on the walls and backsplash too. A remodel is not in the budget and thankfully we aren’t in need of appliances. First, I’m thinking instead of fighting the brick work with it, maybe white wash it, refinish the wood cabinets and add some industrial elements. Like this vintage metal chair for the desk from Get Back. Love this vintage table base from Get Back and the loft style showroom it’s in. Notice the brick is whitewashed. Reproduction potato and gym locker baskets by Peddlers another vendor’s booth we like to stop at. Install professional 12 to 14 gauge stainless counter tops. They look so neat and clean. The bonus recyclable when the infatuation has faded. Lab glass affection started with a grade school science project. To add to my beaker and lab glass collection that I use for flower vases, sorting beads, to holding small collections of this and that; test tubes to hold spices and florence flasks for olive oil, vinegars, water or …. I’ve also picked out a few things for some other rooms but that is for next time…. Thank you all for being so kind and patient looking at all these photos. Do you think this can work as a modest update to our kitchen? Please leave as many suggestions and comments as you care to write. I’ve got some budgeting and convincing to do. As the name implies, the key color is white and the designs simple. We discovered Simplemente Blanco as were rushing through a trade show last year. The display, literally awash in shades of white stopped us in our tracks. We were greeted by the lovely owner and designer Fernada Bourlot who explained almost everything, is made by hand and carefully done. These gauzy, airy linen lanterns are a favorite. Wouldn’t these be great for a wedding? We recommend putting the tea light inside a glass vase before putting into the lantern. Napkin rings with organic touches. And, others with a touch of whimsy. To learn more about Fernada Bourlot’s design philosophy and to see photos of her studio click here. Simplemente Blanco is available at Beach and Bauble. Simplemente Blanco fresh, comfortable, organic, modern.